IoT — the modern technology that connects machines, objects and devices to the Internet, turning them into intelligent assets that can communicate with one another and the world outside. This includes connected cars, machines, utility meters, sensors, smart devices and consumer electronics. It is one of the fastest growing technologies today and is expected to surpass mobile phones as the largest category of connected devices by 2018. IoT devices are expected to increase at a CAGR of 23 percent from 2015 to 2021 driven by new applications and adoption by various industry sectors. Industry predictions forecast 28 billion connected devices by 2021 of which 16 billion devices are expected to be IoT related devices. Cisco predicts that the global IoT market will be $14.4T by 2022. 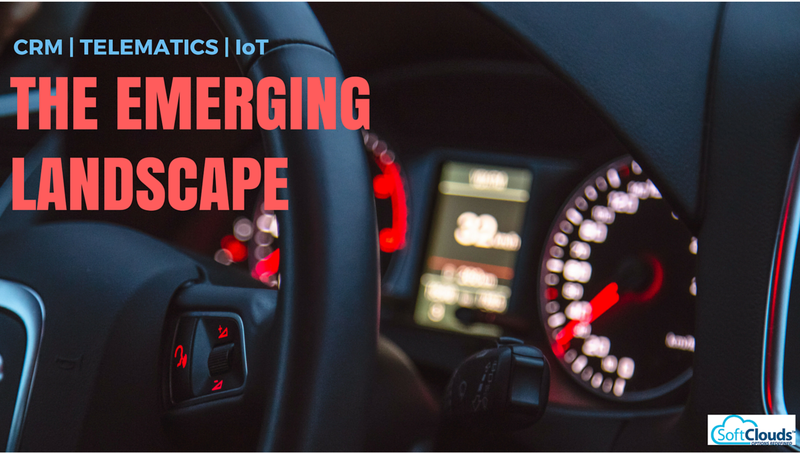 Automotive industry is one of the early adopters of IoT and the number of cars connected to the Internet worldwide is predicted to grow six fold by 2020. The Connected car market is on the rise — Rising consumer demands, the need for constant connectivity, increased dependency on technology and growing number of tech savvy people are driving this market. The automotive industry is growing at a steady rate and within the next two years, global sales are expected to surpass 100 million and continue to rise until 2020. 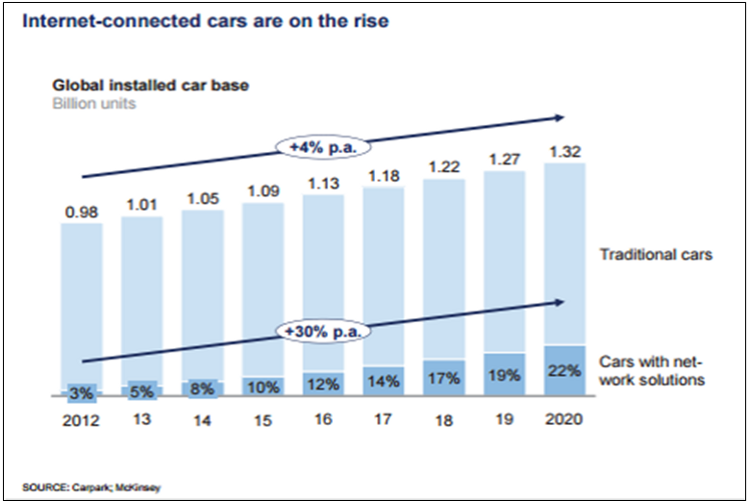 The number of connected cars is expected to rise 30% YoY for the next several years and expected to grow from $156 billion in 2014 to $325 billion in 2018. By 2020, 1 in 5 vehicles will be connected to the internet. Delivering services through the car — Internet radio, smartphone capabilities, driver-assistance, information/entertainment services, tourism information, and the like — is a promising area for future profits and differentiation for OEM's and Service Providers. Customer Relationship management (CRM) helps organizations improve customer responsiveness and focus by gathering and analyzing relevant customer data. The CRM software industry is predicted to be a $36 billion market by 2017 and is expected to evolve and cater to new business needs like automotive, social media, market automation, Big Data, etc. CRM is gaining prominence in the automotive industry and many auto OEMs have already implemented CRM successfully. CRM can help Auto OEMs significantly improve customer satisfaction and retention by optimizing multichannel approaches, strengthening financial services and by integrating CRM and Supply chain management. Traditional automotive industry boundaries are changing with improvements in technology, new entrants, shift to mobility as a service and change in customer preferences for more connected capabilities. Today, the growth across traditional automotive markets and segments is no longer a given. 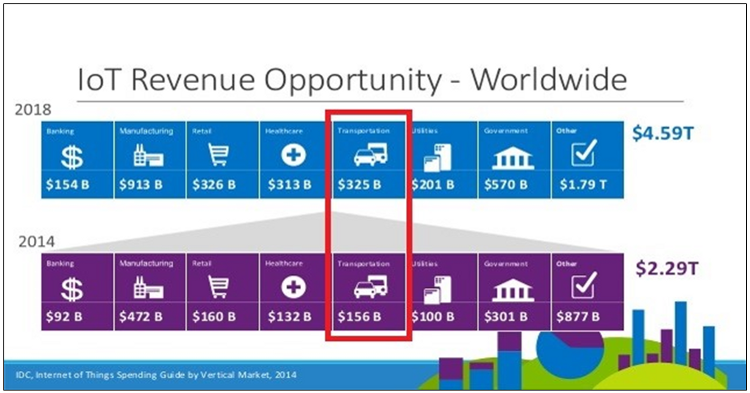 Automotive OEMs face competition from a variety of sources such as mobility providers (e.g. Uber, Zipcar), emerging OEMs (e.g. Tesla), tech giants (e.g. Google, Apple) and recurring, post-sale/services revenue streams. The automotive industry is slowly evolving from competition among individual players towards new competitive interactions, partnerships and open, scalable ecosystems. To sustain growth in the long term, OEMs must adapt to catch up with short term market trends, enable lifecycle product upgrades and form partnerships with suppliers and service providers across and beyond the industry. Therefore to retain their share of the automotive profit pool, OEMs have to evolve their value proposition from "hardware provider" to "integrated mobility service provider." Product differentiation through a digital end-to-end user experience with focus on the customer should be pursued for an Automotive OEM to be successful. Oracle Siebel CRM has had huge success with enterprises and is well positioned to work in emerging trends like IoT. SoftClouds with its expertise in Siebel and Oracle IoT, is working on a solution merging Innovative Technologies — Telematics and Oracle IoT with Oracle Siebel CRM to provide an automotive OEM with the capabilities necessary to provide personalized customer experiences. The user gets a flat tire while driving. The telematics system in the car detects the flat tire and instantly sends a flat tire notification to a call center representative. The representative from the call center calls the user or sends a message immediately, with details about the nearest towing services available or help with any other queries the user may have. The system monitors the odometer reading of the user's car and sends a notification to the user when the car is due for an oil change or tire rotation/change. The system monitors the user's car and sends the user a notification message for better warranty options available based on the odometer reading of the car. The system send the vitals of the car to the CRM based on certain pre-set rules. When CRM identifies a prospect, it sends campaign mails to the user about buying a new car or upgrading to a newer model. The system monitors the user's car and if any problem is detected, it notifies the product quality engineers. They analyze the received data and if any potential issues are found, the customer is notified of possible breakdowns or safety issues even before it occurs. The user's car is proactively monitored, thereby preventing any inconvenience to the user. For an Automotive OEM, offering good and personal services to the customer is not enough. It is also essential to offer those services in a timely manner and tailored to the needs of the customer. SoftClouds with its expertise in Oracle Siebel CRM, Oracle IoT and various other technologies is set right to provide the best solutions to its customers. What more can Automotive OEMs do in the IoT /mobility space? Let us know your thoughts below!